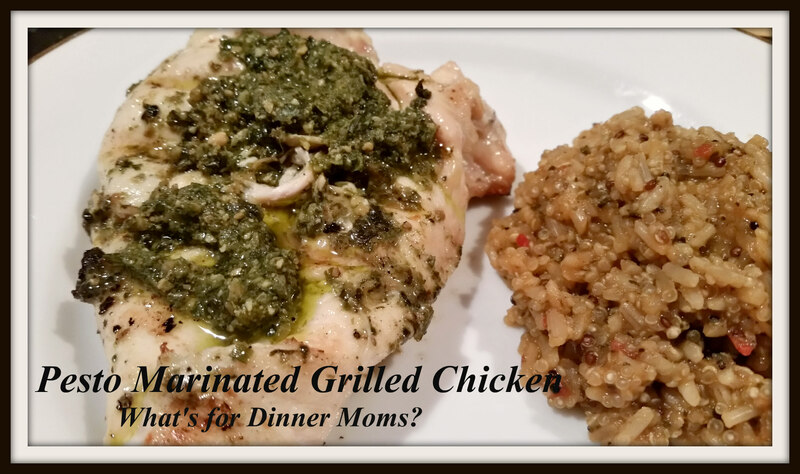 Pesto Marinated Grilled Chicken – What's for Dinner Moms? We are spending quite a bit of time at the beach or out doing things at night. Since the sun doesn’t set until 9:30 pm often dinner is at 9:00 or later for us. We like things that are not too heavy and super easy to make on these nights. Pesto marinated grilled chicken is great because it marinates all day while we are out and we can just throw it on the grill about half an hour before we are ready to eat. We are getting quite a bit of basil from our farm share and pesto is the perfect way to use it up when we have an abundance. The chicken was so juicy and tender. We pounded it down a bit so that it was about 1/2 an inch thick. This helped the chicken breast cook quickly and evenly. Served this with a Tomato Basil Quinoa dish and a green side salad for a delicious and light meal. Place chicken breasts in a large bowl or plastic resealable bag. Add pesto and lemon juice to the chicken. Stir or shake well until all the chicken is well coated. Refrigerate at least 2 to no more than 12 hours. Heat grill. Remove chicken from bag and discard pesto and lemon juice marinade. Grill until chicken is completely cooked through. Be careful not to over cook or chicken may be dry. Coat with extra pesto if desired and serve hot. Looks delicious! I often forget about pesto as marinade! Thanks for posting. Excellent dinner! It’s great you are getting a lot of beach time! Pesto as a marinade is a brilliant idea. Thank you! I forget to do it more often. We love pesto! We do to. It tastes like summer to me too when it’s fresh. I’m excited to try it!